The Toronto Guild of Stitchery will be meeting a wonderful milestone, we have been creating and stitching for forty years strong! In honour of this accomplishment we are celebrating all year! 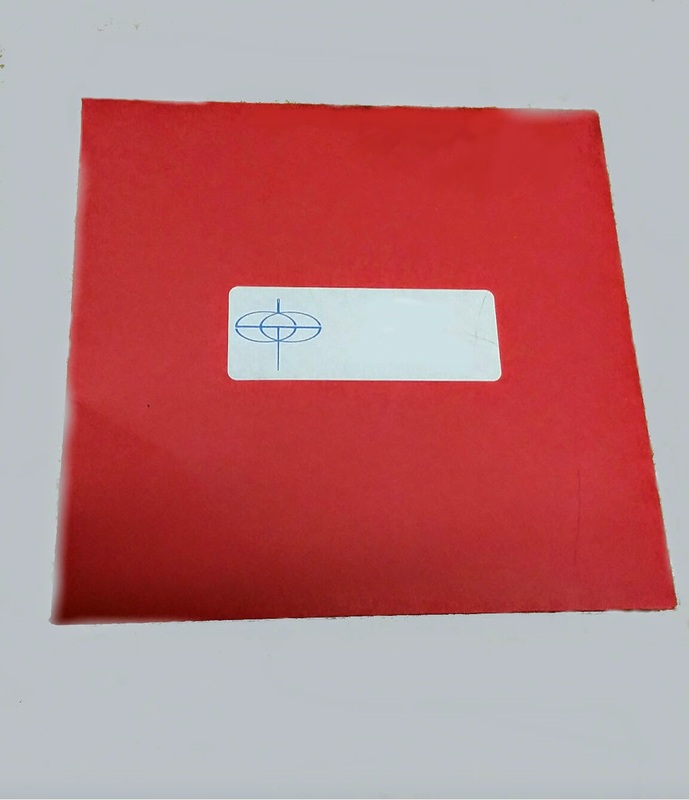 In January we kicked off the year with the distribution of specially designed red self-closing card stock envelopes that revealed a calendar of events for the year, as well as a carefully designed wrought plate booklet. 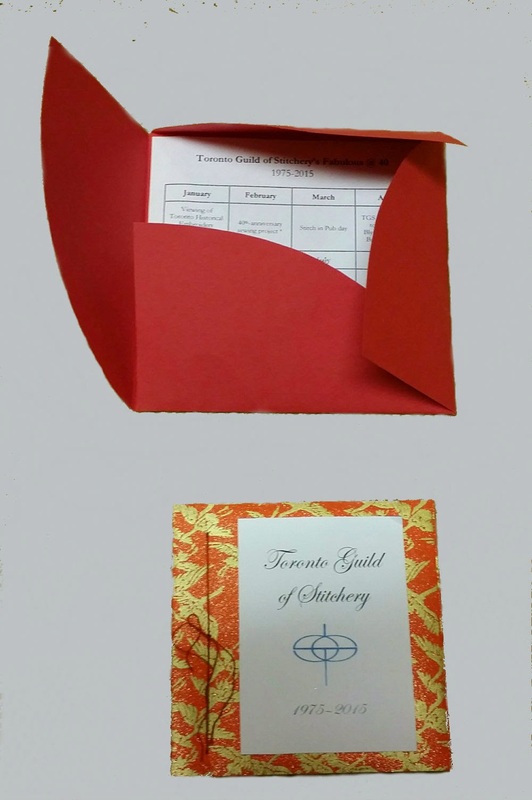 The wrought plate booklet was hand bound by two of our talented members, Christy Thomasson and Victoria Moorshead, with a decorative cover of red print Japanese paper. These wrought plates are meant to go on the back of framed stitching projects to identify the stitcher, describe materials and patterns used, as well as the date it was hewn. In February, one of our many talented members, Diane Scott, designed a nine-sided three-dimensional ornament celebrating our 40 years of stitching together. She chose a 28-count white linen with a variety of red threads. Knowing the many interests of our Guild members she provided a variety of choices for stitching – hardanger, cross-stitch, blackwork, rice stitches, etc., as well as encouraging us to create our own designs. So each ornament will be unique as members embellish each ornament with their own interests or experiments. In March, we are stitching in public at a wonderful pub in downtown Toronto – the Duke of York. It has wonderful natural lighting, great food, and atmosphere. On 2 May 2015, we are having an open house at Blythwood Road Baptist Church from 1-4 pm. We are inviting Guild members far and wide, friends and family to come for light refreshments and to admire the wonderful work that our members do. 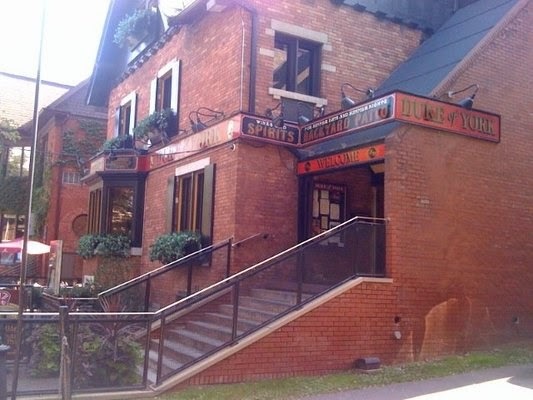 In June we are planning a visit to Montgomery’s Inn in the west end of Toronto. 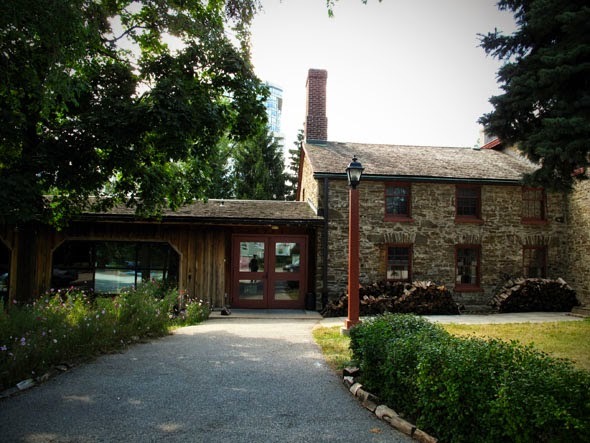 Montgomery’s Inn was built for Thomas and Margaret Montgomery in 1830 but its heyday was 1847-1859 when so many Irish immigrants came to Canada. It has been well cared for and recently restored. Guild members will have a tour of the Inn and an opportunity to have tea and stitch for an afternoon. What a wonderful celebration of 40 years of stitching and friendship! Congratulations on your 40th anniversary!